July | 2011 | "é rayhahn, rayhahn"
For the sixth time in recent days we set a record for St. Louis for the highest daily low temperature on record. We haven’t set any actual record high temperatures, but because it hasn’t cooled down as much at night, our mean temperature for July has been the fourth highest on record. Yuck. WMP decided I needed to start out with a couple tracks by the Eno brothers — who am I to argue? David from Bowman Chrome Collector already won the Best Documentary Oscar; with our second trade, he wins the Emmy as well. This time around I picked up the “Other Teams vs. Twins” cards, plus all the Documentary Gold of Twins games that David had. I made the mistake of looking for some other Twins cards he had to round out the remaining trade amount: I found a ton of older Topps Gold cards. While I picked up a handful in this trade, I’ve already begun a third trade for many of the early 2000’s Topps Gold singles. I’m now down to two remaining base Twins cards, ten or so remaining base “vs. Twins” cards, and I now have a good chunk of both gold sets. Thanks again, David! Last week I nabbed my seventh Twins radio trivia answer, or rather, someone with a name really similar to mine from the same city! Kris Atteberry mispronounced my name, then eventually corrected it, and then mispronounced it again. Oh well. Q: Which Twins pitcher has the most innings pitched in a season without starting a game? A: Bill “Soupy” Campbell with 167 2/3 innings in 1976. My inital guess was Mike Marshall, but he started one game (and it was fewer innings). Next was Ron Perranoski, and finally when I saw Campbell’s total was higher than Marshall’s, I submitted him FTW. Offy from Sports Syzygy bit at my most recent trade bait post and for three BoSox relics he swapped the cards below. I should not have doubted his ability to take a whack at my ’90s wantlists; he included a pair of nice ’95 Pucketts that I’d been looking for for a long time. Thanks again, Offy, you done good! 2008 Upper Deck Documentary is possibly the most polarizing set ever made, outside of any Yankees-only team sets. People either (try to) collect them, or they avoid them. If you are on the side of the line that despises them, you won’t want to hear this: besides collecting the Twins cards, I also collect opponents’ cards in games they are playing against the Twins! And I found the gatekeeper to a motherlode. This leaves me three cards short of completing the Twins base cards. 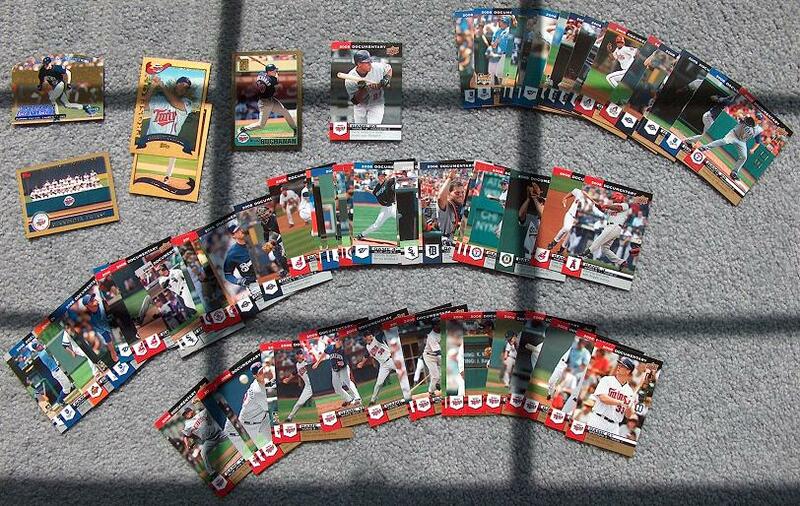 I’m in the process of putting together a second trade to pick up more Gold cards as well as a slew of the remaining “vs Twins” cards that he has, which should almost finish those off as well. Thanks a bunch, David!